While planning a destination wedding, one theme that comes to everyone's mind is having a beach wedding. This is amongst the most popular of all destination weddings. Beach weddings in Mexico are something that no bride and groom can resist. You can arrange for a simple ceremony, walk barefoot, or even have an elaborate affair next to the ocean's edge. And Mexico is one of the most elemental and beautifully located beaches. It is exotic and apt for events as divine as a wedding. Beach wedding is popular because of many factors. These are inclusive of the setting, sun, surf and sand that combine together for the launching of a new life. Mexico is a popular tourist destination, with its scenic beaches, resorts, hotels, spas, unbelievable range of accommodations, and is known as the best host for a wedding ceremony. 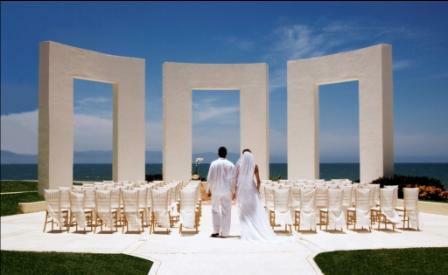 Prior to having beach wedding ceremonies in Mexico, you must know what facilities are available here. You can find wedding ceremonies here along with star rated resorts and an array of wonderful spas. Choose from some of the exotic beaches here, for your perfect wedding ceremony. Whether it is Baja's Lover's beach, Cancun's Isla Mujeres, a relaxed and slow paced beach, or even the most popular Pacific Coast's Puerto Vallarta. If you choose Cancun, then you would be getting a plethora of spots for your wedding ceremony and it is an apt option for all sunbathers. Riviera Maya can be the location for a more private affair, within the contours of the leaning lighthouse of Puerto Morelos. Marriage legality is very strong here in Mexico and recognized too. So, if you want to have a ceremony in one of her beaches, then along with a religious celebrant, you would also require to have a civil wedding ceremony for making your marriage valid. The tourism ministry of Mexico recommends you to fix four days to complete all the wedding ceremony requirements. You would be needing, birth certificates of the bride and groom, translated by the country's consulate along with the jurisdiction, either passport or your driver's license with authenticated validity, x rays, blood tests performed here etc. These are mandatory documents to be submitted prior to the wedding ceremony. Having a wedding ceremony in Cancun is amongst best Mexico wedding. Apart from Cancun, Cabo is another popular destination for the conduction of a wedding ceremony. Cabo wedding is truly dramatic as it is within Los Cabos beach. Sea of Cortez's turquoise colored water, Pacific Ocean's deep blue and sandy beach, would surely capture your soul. It's unimaginable to get betrothed to your soul mate amongst nature at her best. Cabo is like home away from home, with warmth, convenience and luxurious destination. You don't have to think of your honeymoon destination, as this is the paradise for your and your beloved. Enjoy the magnificent beaches, romantic getaways and a fantastic evening enthralled by Mexico's best nightlife! You can always take the help of your resort's caterers, wedding coordinators, planners, and entertainers etc, who would assist you and ease down your wedding preparation. They would all transform your day into a lavish and gala wedding ceremony, thereby making it an eternal day to remember and cherish forever!